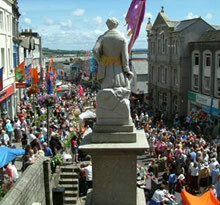 The golowan festival (Cornish for midsummer) is the festival of St John held in Penzance each year in late June. Although it is an old tradition, it was not practiced in the area until 1991 when a group of artists and local schools revived the celebration in order to remember the local area heritage. 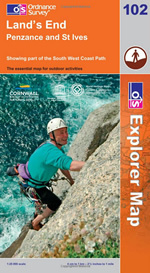 The festival is ten days long, culminating in the Mazey weekend and notably mazey day on the Saturday. The modern Golowan is arguable a little less dangerous. The celebration of the area arts and culture attracts tens of thousands of visitors to the area from local towns and as far as the Asian continent and further. The core of the celebrations is Mazey day, when the streets are filled with market stalls and entertainers, and the towns school children parade up and down market jew street starting at st. johns hall holding aloft large paper mache and wicker creations. It truly is a sight to behold, with some figures being larger than the building around them. The weekend begins with mazey eve and ends with the quay fair. Mazey eve – Penglaz, the Penzance obby oss is set loose around the quay area, leading a procession of dancers and musicians. There is a fair held next to jubilee pool and there is many music events in the surrounding area, including a large music tent at the quay. 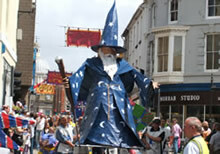 Mazey Day – centres around the parades and other street events in the centre of town. Quay fair – stalls and musical events are held on the quay front. This day has a much more laid back feel to it, and is an ideal day to be part of the celebrations.